Greetings from The 88 Project! We are bringing you news, analysis, and actions regarding human rights and civil society in Vietnam during the week of November 5-11. Two families were denied visits with political prisoners this week: Hoa Hao Buddhist Vuong Van Tha’s wife was barred from seeing him, and Brotherhood for Democracy member Nguyen Van Tuc’s wife was told that Tuc was transferred to a new prison, only after she had arrived at his previous facility. Fifteen protesters who participated in national demonstrations in June lost their appeals on November 9; they will have to serve out their sentences ranging from eight to eighteen months. This week, we remember Luu Van Vinh on the second anniversary of his arrest; he and four co-defendants, also arrested in November 2016, were sentenced to between eight and 15 years in prison for calling for political change in Vietnam. We also congratulate Nguyen Ngoc Nhu Quynh (Me Nam, or Mother Mushroom) on being named one of the recipients of The Committee to Protect Journalists’s 2018 International Press Freedom Awards! However, another female activist will face trial in Vietnam in the coming days. 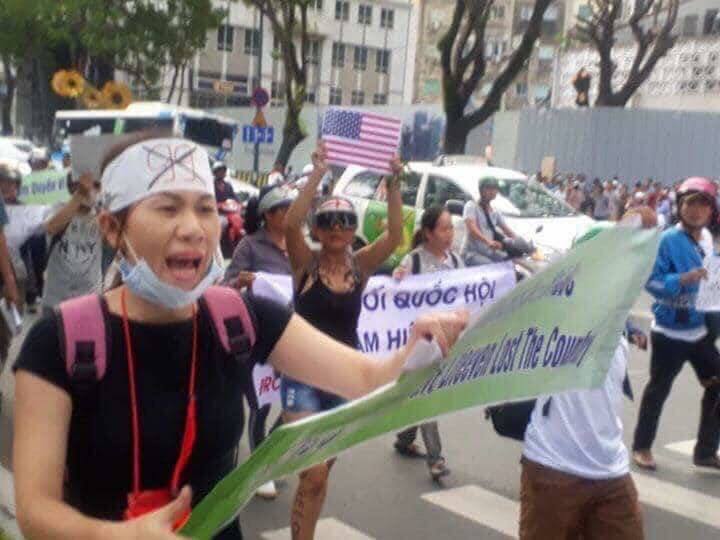 Huynh Thuc Vy’s trial for “offending the national flag” is set for November 22, and she has been placed under house arrest. And Doan Thi Hong, a single mother, remains detained without formal charges after being taken into custody on September 2. In addition, female journalist Thu Le was detained on November 9, beaten, and later released, after meeting with families of political prisoners. Several other activists are at risk after incidents this week: three human rights lawyers were shot at in their car, and authorities set fire to Cao Dai leader Hua Phi’s farm storage area. Also, another prominent member has announced she’s leaving the Communist Party after it punished a publishing house editor for the political content of its books. In international advocacy, two organizations have sent an open letter to the EU raising issues with the draft EU-Vietnam Investment Protection Agreement. And in the news, read about the Montagnard people’s precarious plight, the impending changes to cybersecurity in Vietnam, and the implications of the revised TPP trade agreement. Please take action for Michael Nguyen, a US citizen detained in Vietnam without formal charges since July. On November 5, Vuong Van Tha‘s wife came to An Phuoc Detention Center to visit him but was not allowed to meet him. It has been ten months since his family has been banned from seeing him because he did not agree to wear prison clothes. There is also an update his son’s case: Vuong Van Thuan is now held at Xuan Loc Detention Center, Dong Nai Province. Tha and Thuan are Hoa Hao Buddhist practitioners and activists, sentenced to 12 and seven years in prison, respectively. Bui Thi Re, Nguyen Van Tuc’s wife, went to Thai Binh Detention Center to bring him some medication on November 8. However, the detention officer announced that Tuc had been transferred to Detention Center 6, Nghe An Province, which is 300 km from their family’s residence. When Bui Thi Re visited him on October 18, she had reported that he was in poor health. His cardiovascular disease made him faint three times in one day, each time for 15 minutes, and he is still suffering from hemorrhoids. Moreover, he cannot see clearly because of his corneal inflammation. Transferring him to a far-away prison will challenge his family’s ability to visit and provide him with medication. Tuc is a member of the Brotherhood for Democracy, serving 13 years in prison. Fifteen protesters detained in national demonstrations over two draft laws in June and sentenced to prison terms in July appealed their sentences on November 9 in The People’s Court of Bien Hoa City. Lawyer Dang Dinh Manh reported that the defendants all asked for an acquittal of their charges of “disturbing public order” after originally just planning to ask for reductions in the sentences. They argued that they participated in demonstrations on June 10 because of their patriotism. However, the court upheld all of the sentences ranging from eight months to a year and six months. Blogger and former political prisoner Nguyen Ngoc Nhu Quynh, a.k.a Me Nam or Mother Mushroom, will be honored with one of The Committee to Protect Journalists’s 2018 International Press Freedom Awards. She was forced into exile in October after serving two years out of a ten-year prison sentence for her political and environmental activism. This week, we remember handyman Luu Van Vinh, who was arrested on November 6, 2016 and later sentenced to 15 years in prison. His co-defendants, Nguyen Quoc Hoan (13 years), Nguyen Van Duc Do(11 years), Tu Cong Nghia (10 years), and Thich Nhat Hue (also known as Phan Van Trung, eight years) were also arrested in November 2016. Vinh founded a group called the Coalition for Self-Determination for the Vietnamese People, which he had left a few days before his arrest; others were implicated as allegedly belonging to the group, which called for political change in Vietnam. On November 8, The People’s Court of Buon Ho commune, Dak Lak Province issued the decision to try Huynh Thuc Vy under Article 276 of the 1999 Penal Code for “offending the national flag”. Her first instance trial will be held at 7:30 am on November 22, 2018 by the People’s Court of Buon Ho commune, Dak Lak Province. She faces up to three years in prison. On November 2, 2018, the same court issued an order banning Huynh Thuc Vy from leaving her residence. She was put under supervision from November 6 to December 1, 2018. Vy is blogger and co-founder of Vietnamese Women for Human Rights. Doan Thi Hong, a single mom, living in Ham Tan District, Binh Thuan province, has been detained since September 2 without neither an announcement of formal charges nor an arrest order. After a long time looking for her, her family finally found her at a police station in Binh Thanh Ward, Ho Chi Minh City. However, they were not allowed to meet with her. Her family has not received any explanation about her arrest, which was most likely due to her intention to participate in nationwide demonstrations on September 2. Hong has a toddler who is now being taken care of by the grandparents. Three lawyers– Trinh Vinh Phuc, Le Dinh Manh and Nguyen Van Mieng– who often defend activists, were attacked on November 6. The incident happened while Phuc and Manh were picking up lawyer Nguyen Van Mieng to work on the trial of 20 protesters in Bien Hoa City. After they closed the car door, there was a bang. The window on the right, near Mieng’s seat, was cracked and appeared to have been shot. Right after that, there was a second bang directed at the body of the car. Mieng went to the police in Ho Chi Minh City on November 7 to report the incident; he asked police agency to investigate this case and prevent future incidents. Police set on fire farm equipment that belongs to religious activist Hua Phi, a priest in a Cao Dai church in Lam Dong province, possibly in retaliation for attending a meeting with foreign diplomats. The incident follows a viscous attack in June where he was beaten unconscious by police, as well as several months of pressure from authorities for him to submit to police questioning. Kim Chi, a Vietnamese actor has announced she’s left the Communist Party after professor Chu Hao, director and editor-in-chief of Tri Thuc (Knowledge) Publishing House, was disciplined for publishing translated books on Western political thoughts that were allegedly damaging to the Party. Radio Free Asia reports that Kim Chi is the 14th prominent member to leave the Party since the punishment against Chu Hao took place. In October, the Party originally announced the disciplinary measures, and in response to the announcement, many Party members resigned. On November 9, female journalist Thu Le was detained by police. At the time of the incident, she was in a coffee shop talking with some relatives of political prisoners imprisoned for participating in national demonstrations against the law on Special Economic Zones and Cybersecurity in Bien Hoa City . A group of secret service officers suddenly stormed in and arrested Thu, forcing her into a car. She was released later that night. She later shared on Facebook that she was kidnapped and beaten by Province police. One of the officials, who had boasted about previously arresting many protesters, said that if Thu promised not to report on the case of the 15 protesters sentenced in Bien Hoa City, she would be released. Take action for US citizen Michael Nguyen, who was detained in Vietnam four months ago; still, no formal charges have been announced against him. He is not permitted visits form lawyers nor family. Little information has been available about his case, even to US officials. Call on Vietnamese authorities to release him from detention by signing this petition on Change.org.